Among the number of magazines arriving in the market for those interested in voyages, 'Yathra' published by Mathrubhumi is prominent among them. Yathra, is a complete travel guide printed in malayalam language which is specially designed for people who are interested in voyages. Thickly packed with contents including vivid journeys, travelogues, location details, routes & maps, hotspots, geographical histories and cuisines, this magazine has already become the most popular travel companion. Aptly enriched with colorful photographs and travel guidelines, this magazine is a perfect travel companion. Unlike other travel magazines which focus on the various places, 'Yathra' serve as a true friend giving real time travel experience for the readers. A core team of experienced hands interested in traveling and writing, works behind the screen contributing for each issue. Started publishing in 2008, 'Mathrubhumi Yathra' is completely devoted to travelers. Contents such as vivid journeys, travelogues, location details, routes & maps, hotspots, geographical histories and cuisines gives an inventive reading experience. The magazine has already become the top priority among the readers as it is aptly enriched with colorful photographs and travel guidelines lending hands for those interested in traveling. The previous issues of 'Yathra' featured stories on journey to places like Aluvamkudi by jeep, Coorg Villages by bus, Shimla-Kalka by Train, Ganga-Gandak by Boat and Minicoy-Lakshadweep by ship. A loving journey from Kathmandu to Kanyakumari by bike gives the readers a fascinating journey. 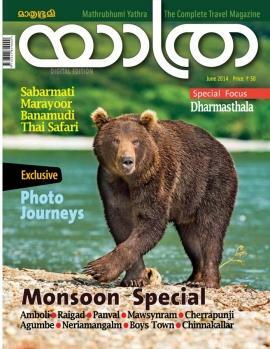 The monsoon special issue gave preference to Dharmasthala with places like Amboli, Raigad, Panval, Mawsynram, Cherrapunji, Agumbe, Neriamangalam, Boys Town, Chinnakallar getting a free ride. Photo Journeys through Sabarmati, Marayoor, Banamudi and Thai Safari has also been a lovely experience from the view of a reader. Some other exciting columns include Exciting Packages, Quovadis, Smart Traveller, Travel Trends, Photo Blogue, Travel Tips, Travel Taste and Parting Shot. If you are fun rider with dreams to explore the world, buy a copy of 'Yathra' magazine and make your destiny a never before thrilling experience.